The load factor should be chosen between 65% to 100%, so that the advantage of saving will be achieved. The efficiency under such condition standard motor efficiency curve will be in drooping nature, but energy efficient motors have flat efficiency curve, Hence, fall in efficiency is marginal. Thus energy saving is significant even in partial loads. The benefits of using IE3 motors are maximum in continuous duty applicatiions like blowers, compressors, fans, exhausters & pumps etc. E2 = Efficiency of IE3 motors. The efficiency methhod used to evaluate the efficiency of IE3 motors is more stringent than the method used in case of standard motors. 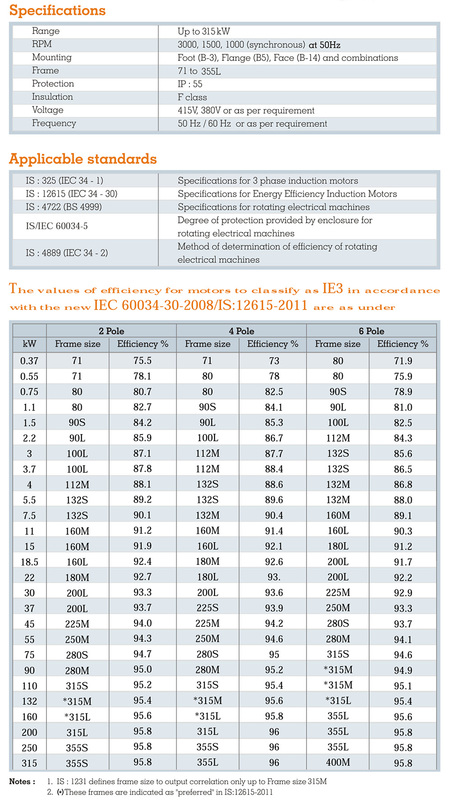 IE3 motors have less slip compared to standard motors. Hence, their operating speed is more. 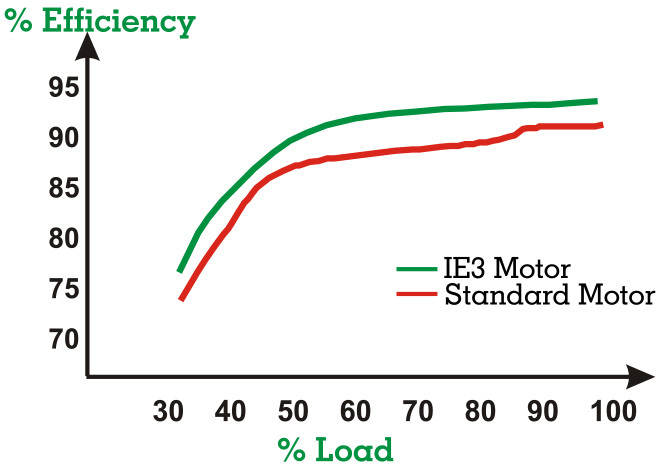 When IE3 motors are used for variable loads, the use of VFD results in effective energy saving. Further, the higher inrush current is not encountered by the motor because the VFD modifies the starting current of the motor. It applies low voltage, low frequency supply at the time of starting. Machine tools, textile, air conditioning, dairy equipment, packing machinery, material handling equipment, geared motors, wood processing plants, solvent extraction plants, edible oil factories, cement plants, petrochemical, pharma and chemical industries. Trusted IE3 / IE4 / Super Premium Efficiency Motor / High Efficiency Motor/ Electric Efficient Motor supplier in Malaysia.